Here-in you'll find the interface description for the Myio project. I've been on a bit of a flip-flip journey on the interface for this project, as per this update. The final result is that I'm going to use my modbus RTU code I developved for the pic16F870 in a smaller PIC16F688. Using EIA-485 (RS485) as the electrical/physical interface layer. 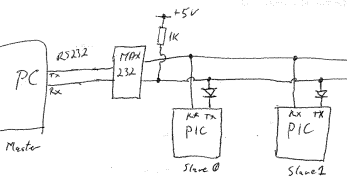 The original test interface using a multidrop 5V serial interface. I developed most of a full modbus RTU for the PIC16F870 using this interface before getting sidetracked on a much more simplistic design. Page Last Edited: 26-12-2008 10:12 AM.